I’d tried a couple times to grow blueberries and I’d failed an equal amount of times. Apparently my standard stick-it-in-the-ground-and-let-it-be approach wasn’t going to work this time. Resolved to have blueberries as part of the SNOW Block Alley project, I signed up for the blueberry class at FarWest Garden Center to get schooled on the error of my ways. There’s a misconception that you can’t grow blueberries in Idaho as blueberries like acidic soil – something we don’t have here. That’s not the case though. You just need to make sure to set yourself up for success right from the get go. If you want to keep things organic, click on the links below to see the products that I use. Blueberries are self fruiting however they get lonely and need a friend. Ok… that’s not entirely true but you’ll get better yields when you have at least two varieties (not to mention twice as many berries). Here’s where it gets tricky though. Plants come in early, mid or late season bearing. Not only will your plants do better when you have at least two but you need two that share a pollination window. So, for example you could have an early producing plant and a mid season variety, or a mid season and a late season plant. Or two of any of the same fruiting window. What you can’t have is an early and a late. When in doubt, get a mid season variety and you’ll be good to go. • Pink Lemonade – mid to late – and yes, it’s bright pink! Another misconception is that blueberries like shade. Go ahead and pick a sunny spot. What they don’t like is wet feet so choose a location where they will get plenty of water (1˝ to 2˝ a week for young plants, 1.5˝ to 3˝ for mature ones) but where the soil has good drainage. Once you picked your spot dig the hole for your plant. Blueberries have shallow root systems so the hole doesn’t have to as deep as it does wide. This next step is key – backfill with Acid Loving Potting Mix. I know it’s tempting to skip this step but, speaking as someone that’s learned the hard way, don’t. This blend provides the pH level that blueberries like so that you aren’t battling alkaline soil right from the get go. 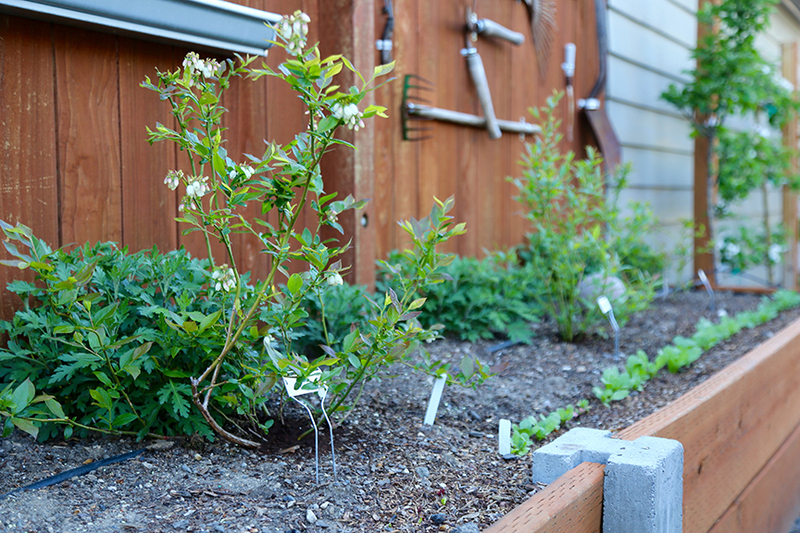 For the ultimate in soil control, blueberries can also be grown in pots. • St Patrick’s Day – around the middle of March apply 1 cup of sulfur per plant. After the first year, also add 1/4 to 1/2 cup of ammonium sulfate. With a 21-0-0 ratio, embrace a less-is-more approach as the high nitrogen level can burn the plants. • Memorial Day – apply a second application (1 cup) of sulfur as well as 1/4 to 1/2 cup of organic acid plant fertilizer. You know that beautiful blueberry bush you bought that has blooms all over it? Or maybe it already has fruit developing? I know this is not what you’re going to want to hear, but this first season you need to pluck all of that off. I know, I know but it’s especially important that the plant puts all its energy in developing a healthy root system and it can’t do that if it’s making fruit so as painful as it is, you gotta do it. Console yourself by thinking how much better those blueberries will taste next summer. So now it’s your second summer with your blueberry plants and guess who likes blueberries as much as you do? Yep… the birds. Consider covering your plants with bird netting well before the berries ripen (no guarantees this will help with the squirrels though). So yes, blueberries might be a little more work on the uptake but spend a little extra time on the front end laying the right foundation and you’ll be reaping the benefits for years to come.